Great surfing, walking and relaxing await you at Leucadia State Beach in Encinitas, California, called Beacons Beach by the locals. Stone Steps Beach and Grandview Beach are two additional access points. Leucadia is a charming beach town, now a community of Encinitas. 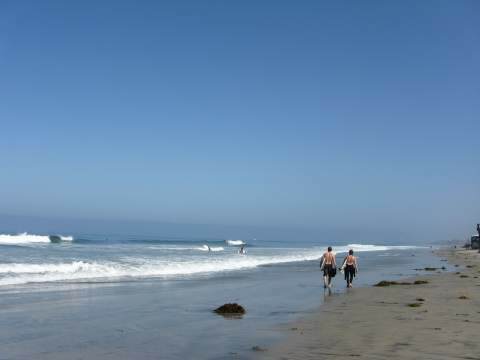 If you are in the San Diego beach communities of Leucadia or Encinitas and want to surf or explore the beach, Beacons Beach is a long narrow beach that runs for about 3 miles from popular and crowded Moonlight State Beach to the south and South Carlsbad State Beach to the north. There are three public access points: Stonesteps Beach, Beacons Beach, and Grandview Beach, with the many San Diego beach rentals along the cliffs. There is a small parking lot and a dirt trail down the steep cliff to the beach. It is popular with surfers and those looking to have a quiet walk or explore the beach. Most of the surfers surf near the Beacons entrance or head north. 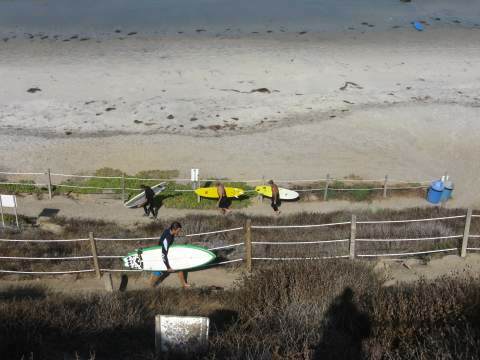 On some days you can see groups taking surfing lessons. 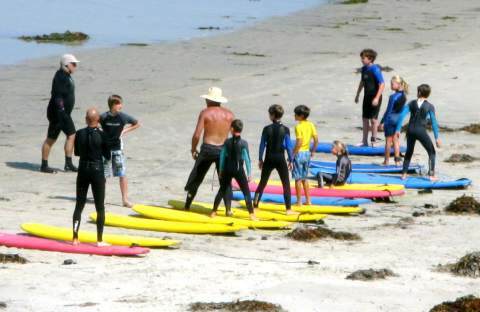 San Diego offers many surf schools and surf camps. Parking: Free parking in small parking lot on Neptune Ave at top of cliff. Also free street parking available. Getting There: Carry your surf board or beach items down a steep dirt trail to the beach below, then carry it all back up. Things to Do: Walking, jogging, sunbathing, swimming, surfing, walk south to Stonesteps Beach or Moonlight Beach or north to Grandview Beach or South Carlsbad State Beach. Facilities: Trash cans at top, otherwise not much else. No restrooms. You much haul your own gear up and down a steep trail, or walk up from Moonlight Beach. Services: None. Closest services are at Moonlight Beach. High Tide Access: High tide (more than 3 feet) can block access north or south as you walk along the beach, which is not a problem for surfers but may limit beach walkers. For more information on the predicted tides see San Diego tide table. Lifeguard: Lifeguards may patrol the beach in a truck or jeep, but are usually not around, so you must surf or swim at your own risk. Things NOT to Do: No alcohol, no glass containers, no smoking, no littering, no disturbing noise, no climbing the cliffs off-trail, no overnight sleeping, camping or parking. Hazards: Rip currents, steep cliffs (stay far away from the cliffs). 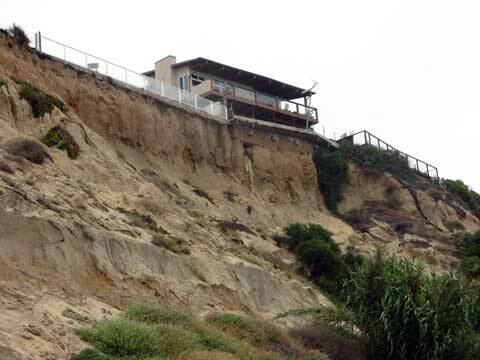 Nature has its own plans, and the ocean is eroding the cliffs along Leucadia State Beach. While some homes have been lucky or successfully delayed the inevitable, others are precariously close to the edge. The Self Realization Fellowship temple next to Swamis is no longer there due to the cliff erosion, although the meditation gardens are open to the public for free, and offer stunning views. Leucadia State Beach Driving Directions - From Interstate 5 in Encinitas, take Leucadia Blvd. west to 101, then continue on W. Leucadia Blvd to Neptune Avenue. Turn right on Neptune, which is a one way street. There is a small free parking lot immediately to the left. If full, find parking along Neptune Ave. A steep dirt trail along the bluff leads down to the beach below.